The event also celebrated Grendler’s scholarly contributions, with the Institute presenting him with the George E. Ganss, S.J., Award in Jesuit Studies. Previous lecturers and award recipients include: John O’Malley, S.J. ; John Padberg, S.J. ; and John McGreevy. A native of Iowa, Professor Grendler received his doctorate from the University of Wisconsin, Madison. He has published ten books and 150 articles. The Roman Inquisition and the Venetian Press 1540-1605 (1977) received the Marraro Prize of the American Catholic Historical Association. Schooling in Renaissance Italy (1989) received the Marraro Prize of the American Historical Association. The Universities of the Italian Renaissance (2002) also won the Marraro Prize. Grendler was editor-in-chief of The Encyclopedia of the Renaissance (6 volumes, 1999), which won the Dartmouth Medal of the American Library Association and the Roland H. Bainton Prize. He was also editor-in-chief of Renaissance: An Encyclopedia for Students (4 volumes, 2004). He has received fellowships from the Guggenheim Foundation, Villa I Tatti (The Harvard University Center for Italian Renaissance Studies), the Woodrow Wilson International Center, the National Humanities Center, the Social Sciences and Humanities Research Council of Canada, and other organizations. 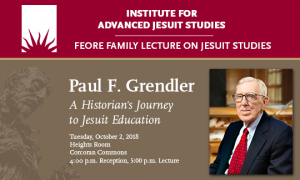 Grendler has been president of the Renaissance Society of America, which awarded him its lifetime achievement award in 2017, the Society for Italian Historical Studies, which awarded him its Lifetime Achievement Award in 1999, and the American Catholic Historical Association. He was elected to the American Philosophical Society in 2002. In 2014 he received the Galileo Galilei International Prize presented annually to a non-Italian who has made major contributions to Italian scholarship. More information about Grendler and the lecture series is available at the Institute’s website.